Commentators have speculated about the decline of the United States as the world’s leading power for many decades, only to see it retain its preeminence. In a new book, foreign policy expert Joseph Nye predicts that the U.S. will stay on top for now but must cooperate effectively with other world powers to address global challenges. Independent journalist Daniel Frey reviews Nye’s latest work. Joseph Nye, Jr., a Harvard professor and foreign policy analyst of the neoliberal persuasion, has written extensively on modes of state power. In his most recent book—Is the American Century Over?—Nye extends his analysis to a question that has long weighed on America’s collective consciousness: Is the U.S. in decline? For Nye, the answer is “no,” but with qualifications. Concerns over America’s global clout go back at least to the Civil War, a conflict which saw the collapse of American democratic discourse and the assassination of a U.S. president. Some contend that worries go back even to the War of 1812, when the U.S. suffered British blockades and attacks on the White House and the Capitol building. Fast-forward to the 21st century and America is on the defensive again after two unpopular wars abroad and a major financial crisis at home—developments that have proven easy fodder for declinists such as Niall Ferguson, Fareed Zakaria, and Immanuel Wallerstein. Other commentators, such as Robert Kagan and Daniel Drezner, offer more optimistic perspectives on the state of American leadership, focusing instead on the country’s strengths relative to the rest of the world. 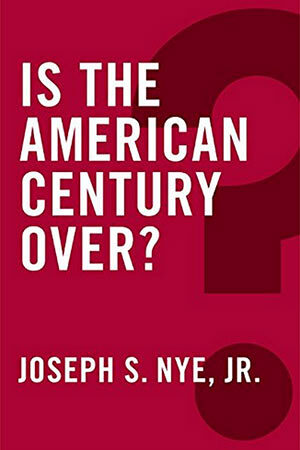 It is within this context that Joseph Nye frames American Century. From the very beginning, Nye takes pains to define what he means by “decline.” He ultimately distills the term down to two categories: “absolute” and “relative” decline. The former, Nye explains, is the result of “domestic deterioration or decay,” while the latter stems from “a decrease in... external power” relative to that of other countries. Nye defines “power” as well, describing it as a multi-faceted commodity that includes means of coercion (hard power), attraction and persuasion (soft power), and economic dynamism. He argues that all these are needed for a country to be able to lead on the world stage. According to Nye, some of the United States’ main competitors for world dominance—Russia, Japan, India, Brazil, and the EU—lack the breadth of power necessary to overtake it. While they excel in some areas, he says, they lag in others. Russia, for example, is the dominant force in Eurasia, but Nye argues that its coercive capacity is counteracted by a lack of soft power and economic weakness at home. In a 2013 Foreign Policy piece titled, “What China and Russia Don’t Get About Soft Power,” Nye wrote that Russia makes “the mistake of thinking that government is the main instrument of soft power,” whereas in reality, it “springs largely from individuals, the private sector, and civil society.” The Kremlin’s promotion of nationalism and anti-liberalism may produce desirable political results at home and in the short-term, but these movements do not help Russia project soft power or remedy the country’s deeper issues, such as corrupt, inefficient institutions and dependence on oil and gas revenues. This leaves Russia with only hard power, and as Nye makes clear throughout American Century, a “smart power” strategy cannot succeed via coercion alone. Russia may cause the West some geopolitical headaches through its use of hard power, but it is unlikely to overtake the U.S. in the near or distant future, Nye says. The author is slightly less confident about the United States’ ability to hold off China. Nye dedicates an entire chapter to the Asian powerhouse, pointing out that it boasts a growing economy, a large nuclear stockpile, and a population four times that of the United States. Although Nye considers China’s assets formidable, he ultimately argues that the country remains decades behind the U.S. in terms of military prowess, economic strength, and soft power. China’s array of military equipment is smaller and older than that of the U.S., its system of trade is less sophisticated, and its countryside remains severely underdeveloped. Much of China’s soft power resources come from the government, just like in Russia, instead of from private businesses, individuals, and civil society. In Nye’s estimation, the next century will not be a Chinese one. A major precondition for the United States to be able to lead internationally, according to Nye, is its ability to retain its domestic health, and Nye is not always rosy in his assessment of conditions at home. He points out that the U.S. is behind much of the developed world when it comes to racial tensions and rates of incarceration and infant mortality. Political gridlock has hampered Congress’s ability to legislate effectively, and income inequality has left many Americans struggling to make ends meet. But Nye also notes America’s many valuable advantages, including the world’s most powerful military, a constant stream of immigrants attracted to its shores, and a business environment that is inviting to entrepreneurs and innovators. In terms of sheer power, America leads the world in all categories—hard, soft, and economic. But when Nye advocates for U.S.-led multilateralism, he presumes that most countries—even nondemocratic ones—will willingly participate in this system of cooperation. While most governments have an interest in resolving transnational issues together with other states, they may not be willing to collaborate if such action is incompatible with other geopolitical priorities or domestic political considerations. For example, strained relations between the U.S. and Russia have hampered bilateral cooperation on terrorism. That drop-off in cooperation may in turn have contributed to the countries’ failure to prevent the Boston Marathon bombings perpetrated by the Chechen-born Tsarnaev brothers in April 2013. Russia’s FSB had actually alerted the U.S. to Tamerlan Tsarnaev’s radicalization over 18 months prior to the attack, but the FBI ultimately did not heed the warning. A multilateral approach to transnational issues may be more effective than unilateral action, but as the Boston bombings demonstrated, it is not viable in all cases. One of Nye’s most conspicuous weaknesses in American Century is that he avoids a substantive dialogue with other scholars of American declinism. Nye’s endnotes are filled with the names of those who have contributed to the debate, but in the text itself, references are harder to come by. When Nye does engage in debate, he tends to focus on arguments that are antithetical to or congruent with his own, but this approach only paints part of the picture. For instance, in his book The World America Made, neoconservative Robert Kagan also dismisses the notion of an America in decline, but offers policy recommendations that differ substantially from Nye’s. Kagan argues that aggressive—and if necessary, unilateral—American leadership on the world stage is necessary to defend the liberal international order. It would have been interesting to see Nye engage with Kagan on the issue of multilateralism, a policy recommendation that is featured prominently in American Century. Stylistically, Nye is best when he does not get bogged down in the details. His prose becomes noticeably drier when he elucidates larger points with polling numbers, GDP statistics, and other data. But his argumentation is sound. American Century is primarily a policymaker’s book, and its thesis is well supported by evidence and historical context. Nye knows his audience and writes accordingly. At its core, American Century is powerful because the future it predicts for the United States—preeminence in a "multipartner world"—is grounded in historical precedent. Nye reminds us that the U.S. has never been truly hegemonic; in other words, America does not need what it never had. If the world of the future is to be defined by multilateralism, Nye argues, the United States is well equipped to lead it.